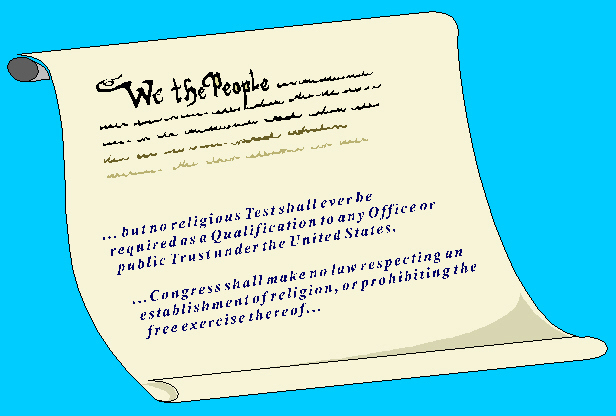 The Separation of Church and State principle is a part of our historical, legal and political / social heritage and preserves and protects our religious liberty. Our page is devoted to exploring the nature and purpose of this principle in an effort to educate the public. We also intend this page to provide a resource to anyone involved in the on-going Church and State debate. Originally we contributed research and articles to Tom Peters' Separation of Church and State Web Page. In 1998, Tom's Web Page was perhaps the most thorough overview of the church and state debate in existence on the Web. On his page were extremely informative articles on the historical, legal and political background of church/state separation. His purpose was to create a response to the religious right's anti-separationist / accomodationist / non-preferentialist views. His web page is required reading! You can find the republished pages within this site. Jim Allison is a certificated paralegal and historical-legal researcher and writer living in Virginia Beach. Susan Batte is a lawyer and a member of the US Supreme Court bar who practices in Virginia. Both have been involved in the separation of church and state debate, researching and writing extensively on the subject, for several years. Why create another separation of church and state web page? First, and foremost, there are a number of anti-separationist web pages in existence attempting to tear down the wall of separation between church and state. We feel the need to counter these efforts with a web page of our own. Second, while there is a wealth of information on Tom's page, we wanted to go in depth into the legal, historical and political / social evidence that exists to support separation of church and state. Though we have brought some of our past efforts forward onto this web page, we do not plan to stop there, but will dig deeper into the meaning, purpose and use of the principle of separation of church and state. Finally, the church / state debate is a timely issue which merits an on-going monitoring of current events. We want to continue to post new information about court battles, proposed amendments, state action and church / state events. We encourage your participation through your comments and suggestions. The Constitution Principle: Separation of Church and State does not collect any information on visitors beyond such information that visitors may choose to place in our guestbook.